Another rooting tutorial for CM Skyfire 2.0 owners, as someone has manage to come up with a very easy tut, to put it in simple words, its just "download and install" process. In case you didn't know CM Skyfire 2.0 is powered with 1.2Ghz Quad Core processor, 1GB of RAM, Scratch-resistant Dragontail cover glass with 5-point Multi-Touch, and running on the latest Android software Jelly Bean 4.1. Going back to the rooting process. 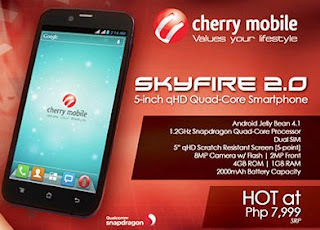 By rooting your Cherry mobile skyfire 2.0, you will get access to its root system, and acquire the ability of your smartphone to install custom ROMS, and many other tweaks. Before we proceed: DO AT YOUR OWN RISK! Confused? Feel free to ask, and we will answer it, when time allows. Sorry to have to ask, but what would be the advantages of rooting the device? aside from being able to take out unnecessary programs.